Home / General News / An Insight Into Farming: What’s Changed? An Insight Into Farming: What’s Changed? At Grazers our family has always been involved in farming and over the years we’ve seen so many changes. The evolution is staggering and we’re excited to see what the future brings. One of the biggest and most notable shifts in the farming industry has been down to the advancement of machinery. Gone are the days where you would need a large work force to plough and harvest, whereas now it can come to a one-man job. This has obviously had an effect on the need for physical man-power and labour costs – a positive and negative, respectively. What are your thoughts on technology? The good old British weather has a direct impact on farming, but perhaps not so much today as in decades’ past. When the warmer weather hit, extra hands were hired to collect the cut hay as it needed to be as dry as possible. Now, the gathering and baling of hay is almost always done by machine, reducing the cost of labour and risk. That said, the impact of global warming and extreme weather patterns provides many of us with concerns. Over the past 50 years or so, farming has become more specialised. Due to supply and demand farmers now compete on a global scale so increasing in size to maximise farm efficiency . In past years’ farms were mixed ie. producing crops and livestock in a rotation for local markets. Due to this farms are generally much larger than they used to be. Methods of pig and sheep farming has changed significantly due to this increase of demand, and the results of this are evident even to the consumer. Try and buy some mutton from your butcher! You’ll find it’s lamb! The most recent major shift for most UK industries has been the vote to leave the European Union. This will most certainly affect the agricultural sector, and dependant on which side of the fence you sit on will determine your view. The results of the vote will only be evident with time, and we hope it will be positive! 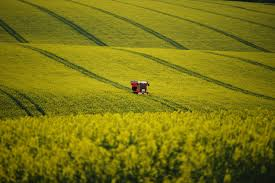 We’re fascinated with the changes in agriculture and the potential for further development in the UK. At Grazers we are huge fans of Integrated pest management which is becoming an increasingly more prevalent factor in farming strategy. Please feel free to contact us for more information about how we can help. ← Who’s That Pest? It’s Deer.